One of the major items on our to-do list once we arrived in Paris was to acquire some sort of transit pass—not having a car, we knew we’d be relying heavily on the Métro (Paris’s subway system) to get us long distances across the city. Although it’s possible to buy Métro tickets for individual trips (or more cheaply, a carnet of 10 tickets), the cost can really add up if you use the system frequently. 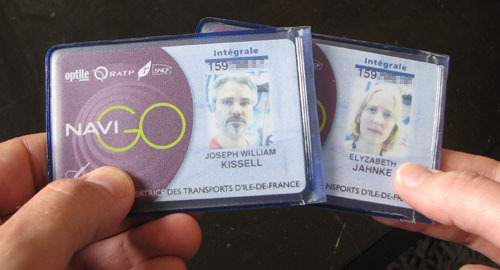 It may seem like a simple task to purchase a transit pass, but the way things are done in France is not always easy. From our previous trips to Paris, we knew it was possible to buy a Carte Orange, which along with a special ticket you purchase separately (or at the same time you buy your first Carte Orange), provides unlimited Métro access to certain zones of the city for either a week or a month. The strange thing, at least for those who are used to buying a transit pass in North American cities, is that to get this short-term pass you need to provide a current photo, in a specific format, to go with the card. Helpfully, there are photo booths in every Métro station, where for 4 Euros you can get four photos of the right size for this purpose (and these photo booths also give instructions in English). Unhelpfully, they only take coins and there are no change machines nearby (for this and other reasons, we’ve found it useful to keep a collection of coins of various denominations handy). Once you’ve cleared the first hurdle of obtaining a photo, the second hurdle is to actually purchase the Carte Orange. Depending on your language skills and/or the mood of the ticket clerk, this can be an easy process or an incredibly stressful one (see below for examples of both types of encounters). In our case, because we are here long-term, we had a further hurdle to clear because we wanted to get a new type of transit pass called a Navigo. With this pass, we wouldn’t need to feed a paper ticket through a turnstile, but could instead swipe our card on a special digital reader that would give us access to the station. Another benefit of the Navigo is that not only can it be “recharged” weekly or monthly at ticket machines, but it can also be recharged by automatic payments from your bank account. Instead, we figured we’d have to get an application form from one of the Métro stations, and send it in along with a photo. Thinking it shouldn’t be too hard to obtain one of these forms from the ticket clerk at our local Métro station, I approached the guichet (ticket counter) and tried to make myself understood. I thought I was saying the right words, but the woman at the counter couldn’t understand what I was asking (or maybe she couldn’t hear me behind the thick glass), and she impatiently waved me away so she could serve the person waiting behind me. I now realize that she most likely didn’t have the forms we needed, and her confusion came from wondering why I was asking her about something that wasn’t part of her job description, but what was communicated to me was mere incomprehension. So, at the time, daunted by her brusqueness, I retreated in embarrassment thinking that it was my language skills that weren’t up to snuff. After regrouping, later in the week we decided to try a different tactic; this time we went to a larger station, which had an RATP office, not just the guichets. Not knowing what to expect, we were pleased to see signs indicating that we could apply for the kind of card we wanted and could receive it on the spot, if we had a RIB (a string of numbers with details of our French bank account). With this number in hand, we stepped into the office and tried again to make ourselves understood. Once again, the woman behind the desk seemed not to understand any of the words coming out of our mouths except the word “Intégrale,” to which she shook her head saying that it is only for residents. When we nodded vigorously, saying that we were indeed living in Paris, she said somewhat incredulously “Vous habitez ici?” (“You live here?”). Once we made it clear we weren’t tourists, she still couldn’t help us; we needed not only our RIB number, but a special piece of paper from our bank stating this number. And we needed photo ID. As we returned home to fetch our passports and bank documents, I was feeling annoyed by the whole process, while Joe was more philosophical about it. “Remember, we’re frustrated because we can’t understand her, and she’s frustrated because she can’t understand us. Besides, she’s probably unhappy with her job and we should have sympathy for her.” Buoyed slightly by his equanimity, I hoped our next encounter would go more smoothly. Afterwards, when we went to buy Cartes Oranges to hold us over until the IntÃ©grale kicked in at the start of the next month, the woman at the guichet had no problem understanding Joe, and the transaction went incredibly fast. It seemed in both instances that we were finally asking the right person, at the right place, and had brought the correct documents. It just proved to us that we can navigate a difficult system in a foreign language, if there is patience on both sides, and if all the other conditions are met. Feeling like we had been through an ordeal, we patted ourselves on the back for accomplishing something that locals sometimes find difficult as well. We had our magical Navigo passes, and Paris was now ours to explore as we wished. Sounds a little like trying to navigate the DMV when we first moved to San Jose, and we were working in the same language!! I remember having to get our little Toyoto truck weighed, of all things, just to get it registered. Later, we found out that our Toyoto Camry wasn’t ‘fit’ to stay here in the US. Much later, I was rather incensed to find out that after 16 years of driving in Canada, I’d need to not only retake the driving exam, but have to study and take the written test again!! I felt like I was 16 again!! This is such a European thing. Every time I visit, I feel like I have to engage the clutch with European clerks in exactly the right way. Pop the clutch, and the transaction is unpleasant or the interchange revs way too fast. I asked one of the shopkeepers for what I thought was “one of those and one of those” pointing. She was very charming and so forth, but as she pulled two of one item out, I said, in my politest German, I beg your pardon, but I meant to say I want just one of each. She looked intensely irritated, like I had practically insulted her, and gave me the correct quantities. An American friend who lives in Paris and who was once told she speaks like a Frenchwoman, wound up purchasing 1 kg instead of 100 g of mushrooms at a nearby market just before I visited her several years ago. She misspoke and said mille instead of cent or something, and as the grocer was pulling out the massive quantity, tried to get him to stop, but he refused. She went along with it, because you have to keep the peace; she realized she’d be going back there all the time. An Italian friend who lives in Seattle can hardly bear to return home to visit her family because of the customer service attitude in that fine country. I had some of those kinds of experiences when I first moved to the US too. I guess what seems reasonable and normal in one country can seem very strange to newcomers in any language. I’ve never had a driver’s license, but Joe would like to get one here, so I’m sure we’ll have lots of interesting stories to tell about that process! I also speak a bit of German (actually my German is much better than my French I think) and I remember visiting Switzerland and being disappointed because I couldn’t understand a thing people were saying! The whole Swiss-German dialect(s) was very confusing to me. A kilogram of mushrooms! Wow. We’ve had plenty of misunderstandings already, but so far none of them have been irreversible. I’m sure it’s inevitable that it will happen to us one of these days. Funny that you mention that you are now keeping a collection of assorted coins around. It really pressed home the difference I think between America and Europe – I’m so used to carrying a coin wallet around with me (like everybody else does) that I forgot not everybody does or needs to. Living in Belgium, so not to far away from y’all. Welcome ! It’s true that in the US there is not such a demand for exact change, or if there is, there are usually change machines nearby. Having only $1 and $5 bills (no $2 coin or bill) makes keeping exact change around a bit more challenging. In Canada, where I grew up, they do have $1 and $2 coins, so it’s more similar to the Euro situation in Europe. We’ve found it takes a little getting used to have heavier coins jangling around in our pockets (haven’t invested in coin wallets yet). Going down the coin sidetrack a little further, we’ve more or less abandoned the 1 and 2 cent coins here in the Netherlands. Your bill is still added up exactly, but it’s then rounded up or down to the nearest 5 cents – in theory it balances out in the long run. That said, a friend of mine tells me that he pays cash when they round down, and pays electronically when they would round up (because an electronic payment is only for the actual amount). In this way, he must make whole euros worth of profit over the course of a year! I was surprised the last time I was in Paris to see the little coins in my change! That seems very sensible. I don’t often need to use 1 or 2 cent coins here, but somehow we’ve accumulated a bunch of them already — similar to pennies in the US. Have you seen the movie Office Space? In it, there’s a plot that revolves around that idea of rounding transactions up or down by a few cents. Love your site. I write “Culture Shock France” which is now in its 7th revision, but a site like yours is even more useful, and up to date all the time. Bravo. Thanks! And thanks for letting us know about your book. We’ll have to check it out. Oh my god! (I’m smiling, no offense! :) This story is SO typical! You just added the behaviour of a non-parisian french coming to Paris for the first time and a non-french-speaking person coming to France! By the way the reason why the woman was surprised to see you asking an IntÃ©grale is because herself could probably not get one ! Another tip: your Pass Navigo can also be used to rent easily a bicycle VÃ©lib’, it’s very cheap and even free the first half-hour, plus one extra quarter if there is no more room available at the station where you want to leave the VÃ©lib’ (if you present your card to the station digital reader). Enjoy! Glad to know we’re not the only ones who have found this type of bureaucracy tough to navigate. And thanks for the tip about using our Navigo passes for Velib’. I will be in Paris in Decem15 to 28th. I found according to my trip buying navigo for 2 weeks is cheaper. So you are planning to purchase the Navigo DÃ©couverte pass for the two weeks you’ll be in Paris? I’m not sure if it’s possible to purchase the pass somewhere inside the actual terminal, but you may have better luck at one of the RER stations connected to CDG (AÃ©roport Charles de Gaulle 1 or AÃ©roport Charles de Gaulle 2-TGV). I haven’t tried to buy the DÃ©couverte at these stations, so I can’t say for certain that they’d be available, but I do know that it is possible to buy them at the major MÃ©tro stations on the RER B line from the airport (Gare du Nord, RÃ©publique). Enjoyed your writing here. And I just got myself a Navigo card decouverte, 3 days after I arrived in Paris. In my case, the worker behind the guichet was really helpful and kept an eye on me to check if I was doing things correctly at the admission- the machine you can buy tickets, that’s how he called it. Maybe it was wise that I chose a time when less crowded. I admire that you can actually join in a conversation in French. What I can say in the language is simple sentences, which I find less useful than talking in English because people of course answer me back in French and I don’t understand 😀 I will visit here often!